This is an Update to my original post on October 20, 2009 and includes the 876 names mentioned in the book. I am hoping that some of you can find this book helpful, it is full of stories and there are 876 names mentioned in the book which you will find listed below for your reference. If you are interested in this book you can work with your local librarian to order it through the inter-library loan program in the U.S. (if you are trying to obtain this book in another country, please contact your local librarian for options). 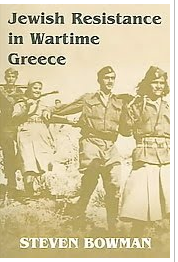 Vallentine Mitchell Publishers offers the following synopsis - "This is the first systematic study of the Jews in the Greek resistance based on archival research and personal interviews. It covers Jews in various aspects of resistance in Greece and other concentration camps. The book is a contribution to the overall story of Greek resistance against the Nazi occupiers and provides hitherto unknown stories of their contributions to that fight. Based on interviews and archival research Bowman has assembled a preliminary list of over 650 individuals who fought or served with the Greek Resistance forces. These include andartes and andartissas, interpreters, recruiters, doctors, spies, nurses, organizers, and a number of non Greek Jews who volunteered or were trapped in Greece during the war years. While the murder of nearly 90% of Greek Jews by the Nazis has begun to enter the holocaust story, the participation of Greek Jews in the war against the Nazis is virtually unknown Greek Jews actively fought in the war against the Italian and German invaders. Veterans and young Jewish males and females went to the mountains to fight or serve in various ways in the andartiko among the several Greek Resistance movements. Other Jews remained in urban areas where they joined different Resistance cells whether as active saboteurs or in leadership roles. A number of Jews appear on the payrolls of Force 133. Additionally Greek Jews participated in the Sonderkommando revolt in the Auschwitz Concentration Camp in October 1944 while others fought in the Warsaw revolt from August to October 1944." I didn't realize there was as 'C" in the Greek alphabet. My maiden name was Carasso, but i think in Greece it was Karaso...Why are there all the "c" names? I know - I guess it depends on how it was translated.